The August WER report provides known details for two FPSO tenders about to be released by Petrobras, describes the FSRU contract awarded to BW Group in August and assesses whether the suspended Rosebank FPSO contract could be soon reactivated. 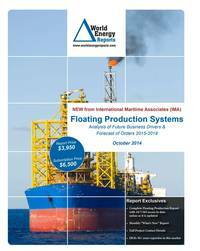 In the data section of the report are details for 246 floater projects in the planning stage, 70 production or storage floaters now on order, 276 floating production units currently in service and 24 production floaters available for redeployment contracts. New to this issue is the production start date (month/year) for all production and storage units in operation – and we identify the likely scrap candidates among the units currently off field. Charts depict the location where floating production and storage systems are being planned, operating and being built. Information is current as of 20 August.